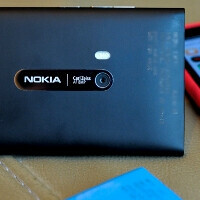 The Nokia N9 carries an 8MP camera with the Carl Zeiss brand, a logo that the German optics maker gives only after rigorous testing of the picture quality. The Texas Instruments chipset and the 8MP shooter working in tandem process HD 720p video, which is about the norm for 1GHz handsets. Nokia also claims that the camera on the N9 is the fastest around on a smartphone, and the interface sports touch-to-focus and continuous autofocus while filming. All these merits are on paper, though - until you see real samples of pictures and videos made with said shooter, every tech detail is in the realm of theory or marketing. Luckily, the Italians over at HDblog have captured a few seconds of raw footage from the preproduction units Nokia is sending out these days, and, from the looks of it, the colors are lively plus continuous autofocus seems snappy, making the Nokia N9 a nice pocket camcorder, especially its 64GB version. WOW!!! This is the definition of the word "cool". Love it!! The more I look at this device, the more I begin to truly believe it can sway a lot of iPhone users away from Apple so long as it gets an ecosystem. true that!..with Android apps' portability it shud get a great portfolio of apps by launch..that would make it fantastic PS. though I feel interested in this device..I cringe at the thought of leaving my awesome 12MP snapper of N8 for this 8MP one...the camera's the biggest thing thats keeping me hanging onto my N8! Nice quality. Colours appeared a bit saturated. Especially with the red flowers. If the "Myriad's Alien Dalvik software" promises becomes a reality, this N9 will be a global hit.